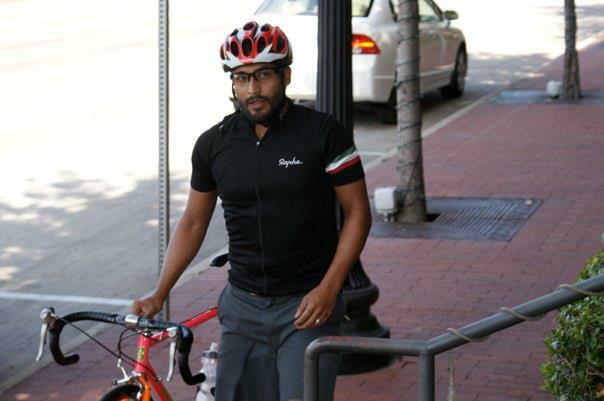 Yesterday at 2PM, while riding from Oak Cliff into Downtown, cyclist Dallas Torres was hit by a car on the Jefferson Viaduct snapping his bicycle in half and leaving him with a broken neck and collar. Fortunately, another cyclist who knew Dallas happened upon the scene while riding into town minutes later and called his wife. Dallas is currently at Baylor hospital with family and friends where they’re awaiting more details on his prognosis. The Jefferson Viaduct is the most direct route for cyclists to take when traveling from North Oak Cliff into Downtown Dallas. Unfortunately, it has two conflict points where traffic merges on the right, leaving cyclists at a dangerous vantage when trying to cross to move to the slow lane. Ean Parsons, an experienced rider who daily crosses the bridge to work, has regularly commented on the dangers of this link. The concerns expressed by the cycling community have led the city to place the Jefferson Viaduct on its “Early Implementation” project schedule within the 2011 Dallas Bike Plan (reference page 33). The potential to develop the far left or far right lane as a barriered two-way cycle track (see below), would create clear separation from high-speed vehicles and help increase ridership by giving bicyclists a safer option for entering downtown from Oak Cliff. With yesterday’s accident as a warning, we should all work with the city to implement this recommendation as soon as possible. Bike Friendly Oak Cliff will begin a fundraising effort shortly, similar to the Fort Worth Avenue Bike Lane campaign, to help cover the costs of installing a jersey barrier and creating signage. We hope to have more details soon. I sure hope he has a fast recovery! That is a very dangerous section of Jefferson St. bridge. That area always scares the crap out of me! Hope that Dallas recovers soon. Barrier looks like the only safe option. I guess I found my philanthropy. I have ridden Houston Street, Jefferson, and Commerce a lot, and Sylvan a few times. Jefferson is the worst of these, safety wise. This is a situation in which total separation is the right answer, and the only viable one. This needs to be pushed for now. The City owns many jersey barriers, many left over from the Formula One race years ago. Placing these on the bridge should not be a massive task. There are some engineering challenges, but they can be worked out, I’m sure! wcasteel: You are right. The crossing needs to be protected by Jersey Barriers. Do you know where the City has stored the barriers they have? This is such a shame. I ride this often at this time of the day and I see very few cars. I always stay left until I pass the entry lanes then check twice before moving right. I’ve never had a problem going or coming from OC. It only takes once though. Hope he gets better quickly. So sad! I tried to call the hospital where the article said he was at because I wanted to send flowers and give him another bike for when he recoverd if he was able to recover; and the hospital said he was never there and did not know what I was talking about??? Can anyone tell me the correct info? He’s on the fourth floor in the Roberts building at Baylor. His first name is actually Israel, but he goes by Dallas. I hope he has a speedy and complete recovery. It’s unfortunate that it takes an accident like this to get something major accomplished. Count me in for a donation! Just let us know when/where. get well soon dallas…i’ve ridden with this guy before…he’s a beast….i pray for a speedy recovery. In the past day this site has received an OVERWHELMING amount of visits exclusively due to this story. For those of you who don’t know Dallas, he’s a very experienced, safe/thoughtful, and strong commuter who rides many miles daily. He’s also a really great guy. So is his wife Marissa, another super cyclist. Below is a link for those interested in learning more about this very unfortunate story that we might not be discussing if bike lanes had been installed on the bridges, as planned by the city. A vote for using Crowdtilt. Locally owned and have been a big support with the Deep Ellum Urban Gardens project. A prayer for Dallas and his family. Jason, and Bike Friendly Members, thank you for the all efforts on behalf of those crossing this bridge and cycling on our local streets. let me know when the fundraising begins. Happy to contribute. Thank you for the info I will see what I can do to help the guy out. Were were made aware of this tragedy by Mike Dunlap. We would like to help raise money for Mr. Torres and his family as well as support you in the fundraising of the development efforts you mention in the article. Would love to chat. Thinking of Dallas and Marissa. Lots of thoughts and prayers are with you! Thank you for offering to help, Marek. We are working out the details of a fundraising campaign now and will touch base with you soon! The city could easily raise funds for bike lanes across brides if they only enforced the law and ticketed the speeders flying 50mph across the bridge. I bike this bridge every morning to catch the trains to Denton. A quick easy fix is in order, and all that requires is portable concrete pylons they use in construction and a do not enter sign, cyclists only. The left lane is ideal, there is only one crossing point. One less car lane will not effect traffic, at morning rush hour there are only 20 cars on the bridge on average. Some asked about the location of the jersey barriers (concrete) left over from the Dallas Grand Prix: For years they were stored under the highways in the area to the West of Reunion Arena. I think some or all may have been moved. Some of us need to go check around the area and see if we can find them! This is a situation in which I sincerley think that more separation than just a painted lane is preferable. Jason, or others. What is the updated timing of the Continental closing and conversion to bike / ped? Funding? For this project we are definitely not recommending moving forward with painted lanes. Too much to chance. We are very interested in acquiring jersey barriers, either those leftover from the Grand Prix or elsewhere, and lining the Jefferson bridge with them. We’ll be releasing our fundraising plan for this effort within the next week or so. It’s going to be huge and we’re going to need lots of support from inside and outside the community to pull off this awesome endeavor. I don’t have the current details re: the Continental. Jason should be able to address. Not sure…I know that the Calatrava is supposed to come online in March, then construction is supposed to immediately begin on Continental. My hunch is that it will be down for at least a year. It’s been a while since I’ve looked over to the left, but I think they’re under the I-45 bridge. At least Google Street View shows the barriers there. One sees them on the ramp from I-30 up onto I-45 north. In the meantime, is there any chance that we could get a “Yield” or “Watch for Bikes” sign installed at those merger ramps? The cost to place the barriers is not that much. The greater cost is likely engineering, restriping, signs, setting up the approaches on both sides, etc. Not sure but the city may be able to actually place the barriers. 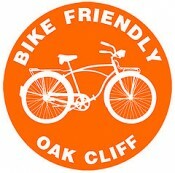 As a member of Oak Cliff’s OLDEST bike club, OCOFOB (Oak Cliff Old Farts on Bikes) we have been riding “bridges” for more than 23 years. We started riding them in a loop (Zang over, Houston back) at 5:30 am back in 1996 and ALWAYS stayed in the far left lane on Zang. The reason is because if you stay in the right lane, like you are supposed to do, you cross over two incoming traffic onramps, putting yourself in danger. We stay in the far left lane and have never had any problems. I suggest the same, even though it goes against what you have been taught. On this bridge, riding to the left, especially in a group, may be safer, and actually better for the cars also, due to eliminating the two (2) merges from the riding lane. I would sugest that everyone try it both ways and see what works best! At the end of the day, if we want free, easy bicycle traffic across the river for all levels of riders, I still strongly feel that separation with jersey barriers is the only way to go. However, this will take time. At this point at the very least signage needs to go up; “Bikes May Use Full Lane” would work, or even the old “Share The Road” signs. Possibly Shared Lane Markings could be done along with signs. BOTTOM LINE:Something needs to happen quickly on Jefferson, and Houston St. while they are at it.